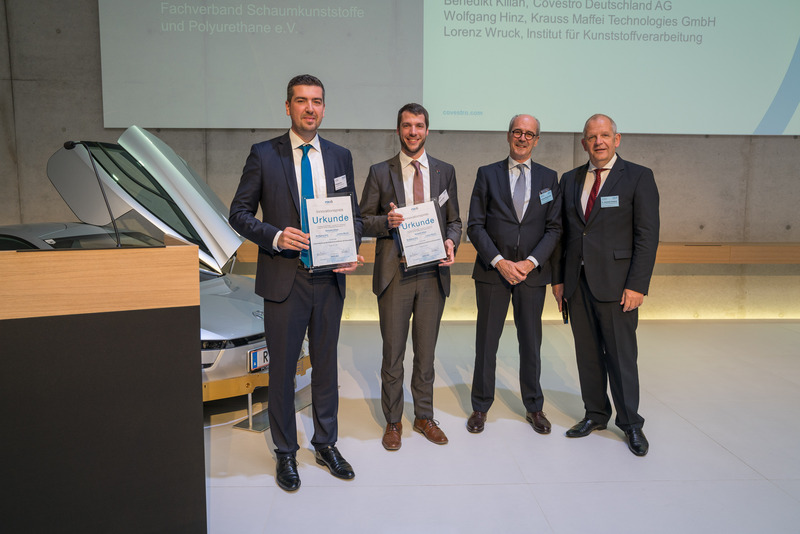 Covestro, together with KraussMaffei and the Institute of Plastics Processing at RWTH Aachen University, was the recipient of the 2017 Innovation Award for polyurethanes. The Specialist Association of Foamed Plastics and Polyurethanes (FSK) elected to honor the partners’ achievements in promoting the wider industrial use of pultrusion with polyurethane resins. Pultruded composite sections have already proven successful in thermally insulating window frames, battery trays in electric cars and in reinforcing rotor blades for wind turbines. The process offers tremendous potential for the continuous manufacturing of composite sections, but more widespread use was prevented until now by the inadequate degree of industrialization. In close cooperation, the three partners enhanced the chemistry, technology and process to significantly increase productivity as well as process and product quality. Processors can now cut costs by up to 24 percent compared to the previous method. In pultrusion, glass, carbon or other fibers are fed continuously from rovings into an injection chamber, where they are impregnated with a liquid, thermoset resin system. The fiber composite cures on exposure to heat in a die. The hardened section is pulled continuously in the process, hence its name. After cooling, the strand is trimmed by an integrated saw. The resulting, straight sections display low weight, paired with very high strength and stiffness in the fiber direction. Covestro and the Institute of Plastics Processing (IKV) at RWTH Aachen University are cooperating closely on pultrusion process development using polyurethanes. The IKV with its long-term experience is supporting Covestro in the fields of polyurethane processing and pultrusion with reactive resin systems in case of development issues regarding pultrusion processes. With 2016 sales of EUR 11.9 billion, Covestro is among the world’s largest polymer companies. Business activities are focused on the manufacture of high-tech polymer materials and the development of innovative solutions for products used in many areas of daily life. The main segments served are the automotive, construction, wood processing and furniture, and electrical and electronics industries. Other sectors include sports and leisure, cosmetics, health and the chemical industry itself. Covestro has 30 production sites worldwide and employed approximately 15,600 people (calculated as full-time equivalents) at the end of 2016. This news release is available for download from the Covestro press server at www.covestro.com. Photos are available there for download as well. Please quote the source.